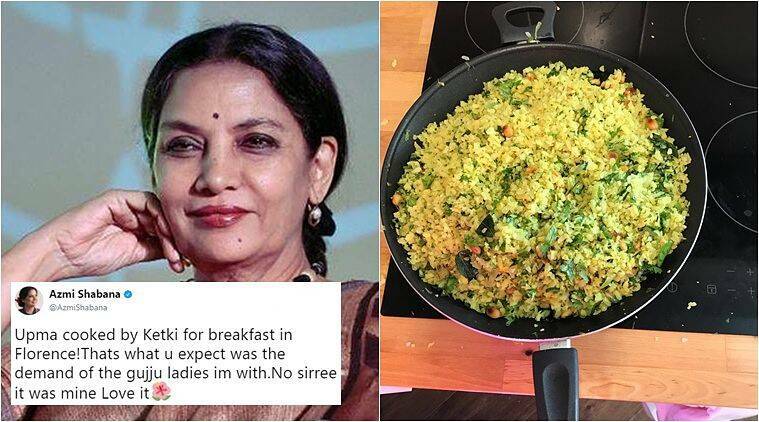 Posting a photo of well, what many insisted is poha, Shabana Azmi captioned her photo — "Upma cooked by Ketki for breakfast in Florence!Thats what u expect was the demand of the gujju ladies im with.No sirree it was mine Love it (sic)". You might think Twitter users are probably just making a mountain out of a molehill, but no sir, when it comes to anything related to food, we mean serious business. So when veteran actor Shabana Azmi recently posted a picture of a delicious looking breakfast dish she made and called it ‘upma’, many on the micro-blogging site couldn’t resist pointing out that it in fact seemed like its cousin poha. Scoff if you want to, but having a sense of clarity over matters is definitely not a wrong thing and Twitter users seem to be abiding by it. Posting a photo of what is definitely poha (we had it for breakfast too), Azmi captioned her photo — “Upma cooked by Ketki for breakfast in Florence!Thats what u expect was the demand of the gujju ladies im with.No sirree it was mine Love it (sic)”. Her caption left a lot of people on the Internet confused, resulting in many confirming what they thought the dish actually seemed like. Check out Azmi’s tweet here. Here are some of the reactions her tweet generated meanwhile. While at it, people took this as an opportunity to start an amusing thread. Just like how the 67-year-old called the dish upma, for instance, one Twitter user posted a photo of Zoya Akhtar with the caption “Ma’am, Farhan is my favorite Director” and another posted a photo of roti calling it pizza. Check some of them out here.